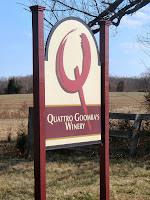 Today we finally had an opportunity to listen to live music at a winery so we headed out Route 50 to Quattro Goomba’s Winery (QGW) - a winery with a completely different business model than its neighboring wine colleagues. QGW was officially formed by three friends - Jay DeCianno, David Gaetani, and David Camden - in the fall of 2006. DeCianno and Gaetani were raised in Italian households where homemade wines were common and learned the art and science from their grandfathers. They decided to become partners in making wine, starting in their basements. 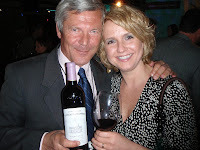 After two years honing their skills, they became bonded in 2006 and sold the wine through the WineStyles retail outlets. After the initial success, the opened their current tasting room directly on Routh 15, north of Gilbert's Corner, in the fall of 2008. Now, there are dozens of wineries that started in a basement - or bathroom - but what makes QGW unique is that they source their grapes completely from outside the state - California, Chile, and Italy. They utilize brokers to suggest the vineyards and transport the juice or grapes; but only after the proprietors at QGC have conducted an extensive cost\benefit analysis and sampled wine made from grapes from the prospective vineyard. One they select a vineyard, it must meet stringent guidelines on quality (ie. acidity, brix) and vineyard control (what chemicals to use and when to apply). The growers segment a lot for QCW and are financially responsible if they fail to deliver fruit that meet their contractual obligations. 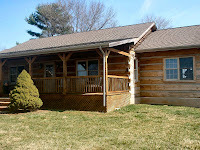 Eventually the owners would like to become a Virginia farm winery and plan to plant a small estate vineyard beside the tasting room. They will also source grapes from Breaux Vineyards in order to sell Virginia made wine. In order to satisfy the definition of farm winery, they are not required to produce wine from their estate grown grapes - only from Virginia grown grapes. This will give them time to slowly acquire the necessary vineyard skills to grow grapes and manage a vineyard. 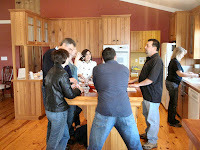 When we arrived Dave Pepper was already performing in one corner and a group of tasters surrounded one tasting bar. Soon David Gaetani walked us through their portfolio - which interestingly only included two wines available for sale. For when they started, they only made 300 cases - and most of these sold out quickly. They plan to ramp up to 2,000 cases a year, but until these wines are bottled - we tried barrel samples served in carafes. We started with their only white - the soon to be bottled Vino Di Frascati, made from Trebbiano and Malvasia Bianca grapes. Because of its proximity to Rome, the wines from the Frascati region have popular for over 2,000 years. The juice for this wine was transported in 57 gallon drums - taking about 17 days to reach the winery. Not a bad trip. 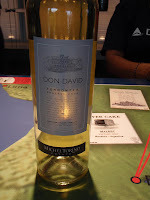 At our tasting, the wine hadn't been clarified so it looked more like lemonade or a lemoncello flavored drink, than wine. But it was probably our favorite wine of the day - fruity and refreshingly acidic. We can't wait until this wine is bottled; perfect time for warm weather. The next wine that was another favorite was the Vino Di Nanni (Wine of our Grandfathers) - proprietary family recipe made from two red and one white varieties. The wine has a pinkish tint, but is not a rose since the juice was not bled from the skins. Instead the color results from the composition of the grapes. This wine is also dry, but fruity enough were we can see it drunk chilled. When the proprietors formed QGW, their goal was to make Mediterrean styled wines that were drinkable now and not necessarily with food. Their Chilean Merlot definitely hit this mark - it is dry and full bodied but amazingly smooth. The wine had undergone malolactic fermentation, converting the malic acids to lactic acids, and it showed in the finish. 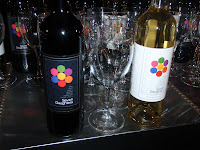 The following two wines were an interesting combination - made from the same varieties and vintage; but a different location: Vino D'Ana California and Vino D'Ana . Each wine is made from equal percentages of Merlot and Cabernet Sauvignon; however they are completely different. The Chilean wine is fruitier whereas the California version has a much peppery nose and earthy flavor. What's interesting is that is usually describes the comparison between California and French wines; but in this case, the California is the Old World wine and the Chilean the New World wine. We finished with their Vino Dolce, a dessert wine made from late harvest old vine zinfandel. Even though the wine has 4% residual sugar, it is not not syrupy and sugary. Instead its more like drinking dark raisins - similar to the Cyprus Commandaria we tasted recently in south beach. The final wine in the portfolio, currently aging is their popular Vino Di San Pietro, a Super Tuscan blend of 80% Sangiovese with Cabernet Sauvignon and Merlot. The 2007 vintage sold out quickly. Afterward we relaxed on the deck playing with dogs, watching horses, drinking wine, and listening to the music. 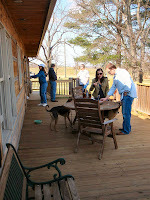 The winery is very dog friendly as described by Ms. Martin below. And the music completely complemented our visit - it was just nice to have music playing in the background. In fact we learned from Pepper that he enjoys playing at QGW because he has complete control of the setlist. Apparently that is not always the case - particularly when an agency is involved. Look for him on Sundays and when the winery hosts a larger concert on April 18th. This event celebrates the release of the Vino Di Frascati, Merlot and Vino Di Nanni wines and features Gaetani's rock band Swiftkick. You should see us there. Quattro Goomba's Winery: Pet-Friendly and Fun! Our family, which is comprised of myself, my husband, and my two mutts, Titan and Sox, went out for our usual "nice day adventure" to a local winery and found ourselves at Quattro Goombas for the first time ever this afternoon. Much to my surprise, Quattro Goombas is very pet friendly; they not only allowed us in the tasting room with our pups, but also served our thirsty monsters water before they served us wine. 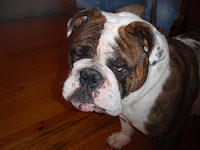 It's hard to win me over because I am a very tough critic but taking good care of my dogs is always a great start! My family is from Spain, I have lived and worked in France, and was involved in the restaurant and hospitality industries for many years. I have had the pleasure of tasting fantastic wines from all over the world and Virginia wines don't always measure up, however, Virginia wineries offer tons of fun, beautiful views, and local entertainment that is oftentimes hard to beat. Quattro Goombas made today's visit more fun that usual because they welcomed our pups with open arms. It's tough for a dog-lover like me to leave my dogs at home while I enjoy a day out in the sun, therefore, finding a winery that allows me to share my love of the outdoors with my mutts is truly exciting. The staff members at Quattro Goombas approached our dogs with interest and care and made sure that we felt welcome and comfortable from the moment we arrived on their property. Many of the patrons were also open to the prospect of having dogs in their midst. Titan and Sox got loads of attention and love as well as bits of cheese and crackers, which they usually wouldn't get at home. All in all, my husband and I had a wonderful time getting to know other Northern Virginians and watching our dogs take in the views and treats that Quattro Goombas threw their way! Quattro Goombas is definitely at the top of my list for pet-friendly wineries in Northern Virginia; I'm pretty sure Titan and Sox would agree! While viewing winery events at WineCompass and MyJoog we have seen a literal explosion in the number of wineries that provide live music in Maryland and Virginia. In the past you could count on the summer concert series at Tarara Vineyard & Winery, Linganore Wine Cellars, and Chateau Morrisette as well as a few random shows at several wineries; but now there are good shows every weekend. Particularly in Loudoun County. Notaviva Vineyards is the most appropriate place to start since the winery was specifically designed as a live music venue. 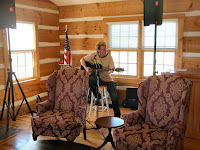 The winery provides year round entertainment on weekends in this spring they are hosting several talented local and regional artists: Ken Wenzel, Luke Brindley, Todd Wright, David LaFleur, and Mary Ann Redmond. 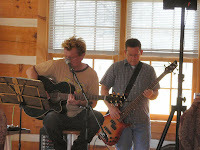 Neighboring Loudoun Valley Vineyards is also providing Ken Wenzel a steady gig on Saturdays. 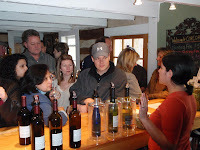 And Bluemont Vineyards and Quattro Goomba’s Winery showcases local artists on weekends. Expect to see Lenny Burridge Saturdays at Bluemont and Dave Pepper and co-owner David Gaetani's band Swiftkick on Sundays or during special events at QCW. For those living in other counties in northern Virginia, there are other options. In Fauquier County, Barrel Oak Winery provides live music on Friday nights and Saturdays which include our favorites Robbie Limon and farmDoubt. And nearby, Fox Meadow Vineyards hosts a few artists this spring. 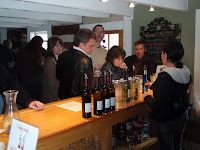 Along the 95 corridor, try Potomac Point Winery. Besides good wine and a incredible chateau, don't miss Dave Goodrich, who plays a few times this in the coming months. Blue Ridge Vineyard or Eli Cook at Blue Mountain Brewery (yea, not a winery - but close to many). Maryland does not provide as many options as Virginia, but there are still good opportunities particularly at Frederick Cellars. Their neighbors are trying to beat them down, but let's hope they fail. Otherwise where else could you sip award winning Riesling and Cabernet Sauvignon while listening to Bo Weevil and Karyn Oliver. Besides their annual festivals, Linganore Wine Cellars opens its doors on Sunday's for local artists. These are examples of regular scheduled music. There are even more opportunities to listen to live music at wineries when festivals are factored in. Plus you get to drink good wine. 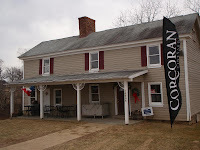 Planning a Spring birthday party enticed us to visit Corcoran Vineyards, one of our favorite Virginia wineries. Not only are the proprietors, Lori & Jim Corcoran, friends, but they craft excellent wines. Just look at their medal collection. With a tasting room built in the 1750's, a pond, and rolling vineyards; we thought this would be a great venue for our son's birthday. The major question on our minds: was it too far for parents to drive? The answer came quickly as we had trouble finding a parking space. For a late February weekend, the winery was packed. Obviously distance was not a factor. 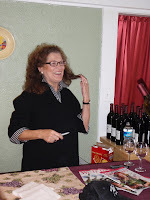 The high volume of visitors may have been influenced by the appearance of Mary Watson Delauder, who was pouring and signing bottles of her Mary's Cuvee. This wine was a collaborate between Mary and Lori, where they basically sampled from different barrels to concoct a suitable blend. Predominately Cabernet Franc and Merlot, the wine also contains a little Tannat which contributes an earthiness to the wine. It's a real nice blend - fruit forward from the Cabernet France with a "herbish" tail from the Tannat. There was only a few cases left and wines were moving fast, so they may be sold out already. The other red wines are just as good: the varietal Cabernet Franc, Chambourcin, Malbec, and Meritage (Cabernet Franc, Cabernet Sauvignon, and Merlot). The Malbec is our favorite. For whites, all you need is the Chardonnay. Particularly since their Viognier is also sold out. 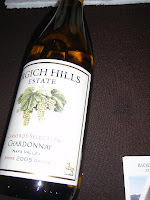 The Chardonnay was aged in neutral oak and stainless steel to produce a nice wine. There's just enough oak at the finish to balance the fruit and acidity. They had also brought our for the day their semi-dry whites: Traminette and Seyval Blanc. The Traminette is drier that contains the spiciness associated with the grape. The Seyval Blanc is sweet lemons - enough sweetness to make this a dessert wine, but we have friends who down the bottle in one sitting. We can't wait to try the wines again at the birthday party. Hopefully the weather will cooperate. The primary focus of the South Beach Wine & Food Festival is the Grand Tasting Village - located directly on the sands of South Beach. The village is split into two sections; the bow contained the seminar tents, sponsor tents, and this year a Wines of Spain display, whereas the stern consisted of two large tasting tents. In previous years we had spent the large proportion of our time in the tasting section; this year we decided to actually attend a few seminars and browse the sponsor tents. 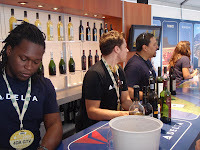 We loitered in the Delta Airlines tent for awhile where they not only served excellent wines (Don David Torrontos), but we learned that the airline uses an elaborate system to select wines for their BusinessElite® customers. In house sommelier, Andrea Robinson, accumulates over 80 wines that met a strict criteria of outstanding flavor, brand recognition, diversity and destination connection, as well as ease of serving in flight. She then tasted the wines at 30,000 feet; apparently the structure of wines can change at high altitudes. Ms. Robinson then selects a final array of wines from those that passed the "flight" test. She will also hold "wine culture" seminars for flight attendants that will "enhance the personalized service they provide to Delta customers." We may have to consider Delta for our next international travel. Back to the festival, on Saturday we saw Ingrid Hoffmann strolling the sands without the standard entourage that usually swarms around a Food Network personality. She cheerfully greeted attendees posing for snapshots all the while reminding people the time for her seminar. She became an instant favorite - no pretentiousness - she could have been just another party goer. 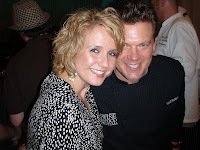 But after watching a few seminars, our favorite Food network personalities were easily the Neelys. As with Ms. Hoffmann, they also fit naturally into the environment and had a playful relationship. Plus they were preparing mac and cheese keeping it simple. 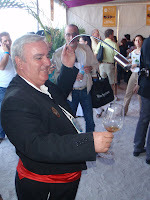 The Wines of Spain was a somewhat obvious choice for a special tent, not only from Miami's Spanish background but also because of the rising status of their wines. There were over two dozen vendors, so too many wines to taste in one setting. Thus we stuck to cava and the sherry - being poured directly from the barrel. We are neophytes regarding sherry so this was a nice education, learning about the Solera process in the Cardenal Mendoza as well as the history of the product. 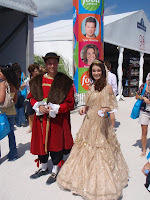 But of course, throughout the day the tasting tents were a constant magnet and eventually we succumbed. The South Beach festival has the largest assortment of spirits of its kind so this year we planned to keep to that genre. We eventually tasted a few wines that caught our attention, but in general we stuck to the vodka, gin, brandy, cachaca, and rum. And was there rum. Many of our favorites that we have discussed previously were on hand (Vizcaya, Diplomatico, and Ron Barcelo); but within a few yards of the first tent we struck gold. 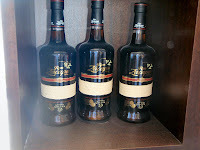 Gold as in the Ron Zacapa Centonario (23 years) - perhaps the best rum ever produced (At least in our estimation). And according to Robert Pallone, the resident Rum Ambassador "it's won so many tasting competitions that it's actually been retired." This rum is made from the juices from the first press of sugar cane, like a rhum agricole, and distilled in the high mountains of Guatemala of Quetzaltenango. 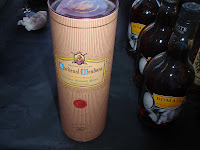 The rum is aged white oak casks using the "solera" method the same method as sherry. Basically the angels share lost through evaporation is replaced with rum that was casked the following year. We also tried a couple new rums that are worth naming: Ron Atlantico, Angostura and Ron Botran. 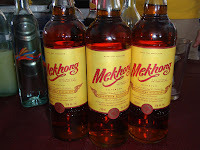 There was also a Thai rum, the Mekhong, named after that country's national river. "The amber colored liquid is the result of a unique combination of an age-old distillation process followed by the artful blending of this quality spirit with a unique (and secret) recipe of indigenous herbs and spices that brings out its classic taste." The spices provide enough variety to make this an interesting drink neat - but they advertise it more as a mixer. These last rums were nice, but after drinking Ron Zacapa, Vizcaya, Diplomatico, and Ron Barcelo; there was no more room at the top. Sorry. The newest novelty and perhaps the most popular vendor was the LIQ Frozen Cocktails. 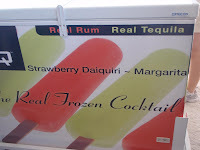 Yes frozen strawberry daiquiris and margaritas on a Popsicle stick - made with real rum and tequila. Our first question was "How do you get the alcohol to freeze"? Well, they employ a proprietary system that somehow freezes alcohol. The pops are 100% pure ingredients, the strawberry daiquiri includes real strawberries that melt with the Popsicle. And tasty. The company has even planned how to get the product into retail outlets that normally don't have freezers. They provide their own. This is one product that fits with south Florida - if they only sold it on the beach. We also re-tasted several spirits that we discovered at last year's New York City Food & Wine Festival. The Castries Peanut Rum tasted as good in South Beach as well as it did in New York. The same holds with the Whitley Neill Gin. One of our favorite creme liquors, Amarula - made from the African Marula fruit was also on hand. Whiskeys were represented by Evan Williams bourbon and Glenrothes scotch. There were several new products we liked. 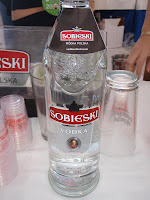 Our favorite vodka was the Polish Sobieski Vodka - named after King Jan III Sobieski. The brand was launched by Imperial Brands only two years ago and is already the world’s #7 best selling international vodka. In its first year the vodka was awarded a Gold Medal and the "Best Buy" award by the Beverage Testing Institute (BTI), and was ranked the #1 premium vodka and #2 overall in a random blind-tasting of 108 vodkas, the largest review of vodkas in its history, that included extravagantly priced super-premium brands. The last sentence is important because a bottle retails for approximately $11. What a bargain. 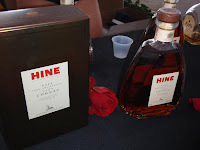 We also learned about cognacs from the House of Hines - particularly that cognac shouldn't have the harsh bite that we normally experience in the states. In fact, many of cognac brands are specifically made in this style and targeted to certain communities. Not Hines. Their brandy has been produced in the Cognac region for over 250 years and meet the strenuous legal requirements in order to bear the name, Cognac. Its smooth finish was enough of a raw to keep us coming back. We did sample a few wines. 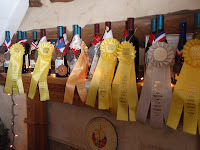 The first set of wines we tasted were from the Finger Lakes' Heron Hill Vineyards. We had to support east coast wineries. They were pouring two nice Riesling styles a dry and semi-dry. Can't go wrong with that. The other set of wines we tasted were from the Greek and Cyprus alliance booth. How could we pass on wines made from regions with centuries of wine making experience. We learned that the oldest named wine in the world, the Commandaria, has been produced in Cyprus since 1,000 B.C. Today there are 15 indigenous grape varieties found on the island. We started with the Greek wines and loved the Assyrtiko - a white wine grape indigenous to the island of Santorini. 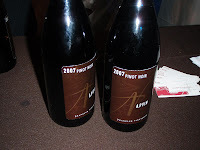 There were also two exceptional reds. 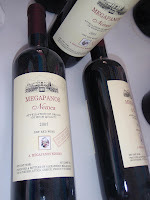 The Megapanos Namea made from the Agiorgitiko grape, but named after Nemea region of the Peloponnese and the Pavlou Winery Xynomavro, produced in northern Greece. Moving two the Cyprus wines, they actually had a version of the ancient Commandaria, the St. Nicholas from Etkos Winery. This dessert wine is made from the ancient Mavro and Xynisteri grapes that are spread out to dry in the sun, then pressed. The juice is collected and fermented in old, very large wooden barrels. 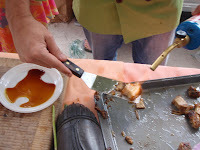 The result is a sherry like substance with caramel flavors without the fortification. A nice dessert wine. Its companion is the Centurion - made in the same style just aged longer (at least 30 years). This is a potent wine, once again not fortified but with a deeper richer dark raisin \fig flavor. The downside - $130. 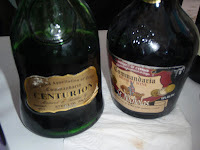 Our budget favors the Commandaria ($20); but our tastes the Centurion. The food served in the tasting tents was also outstanding. 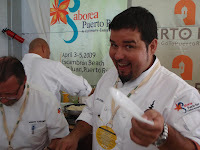 Each day, the Puerto Rico booth prepared outstanding dishes. We also enjoyed grabbing a Agua Luca cachaca and pairing with guacamole from Rosa Mexicana. The most entertaining chef was Eric Grutka from Jensen Beach's Ian's Tropical Grill, who used a hand held propane tank to sear pork bellies. There was plenty of other food that made this an overwhelming success. 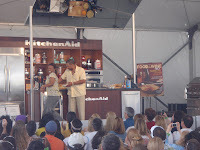 Representatives of the Washington D.C. Food & Wine Expo should take notes - the SOBE Wine & Food Festival is a real Food & Wine event. On the first full day of the festival, Friday the 20th, we actually took it easy during the afternoon Trade Tasting because we had a full schedule planned for that evening. 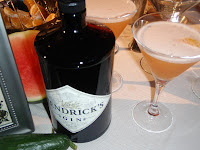 It all started with a cocktail hour at The Tides for Batali Rocks - sponsored by Hendricks Gin. The event showcased the collaboration between chef Maria Batali and wristwatch designer Leonid Khankin. Under heat lamps - yes it got a little chilly in the evening - we ate h'ordourves and sampled some interesting gin infused concoctions. After a cucumber laden drink we switched to gin on the rocks - much better. 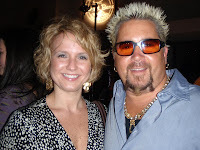 After meeting Guy Fieri we were forced to leave in order to arrive punctually for the evening's main event: Wine Spectator’s “Best of the Best". The Best of the Best was held at the Fontainebleau, which had just finished a $1 Billion renovation. Yes $1 Billion; talking about bringing a Vegas casino to the beach. We were pretty naive about this event, we knew the wine would be good, but we completely underestimated the quality of the food. This event was the bomb. Walking in you were immediately inundated with awesome wines: Beaulieu Vineyard, Far Niente, Stag's Leap Wine Cellars, Provenance Vineyards..... We started with a Grgich Hills Cellar Chardonnay - how could you go wrong - and the wines got better. Many of the wines just listed are household names, but we found many new finds - and mostly Pinot Noir. There was the Trolley Pinot Noir from Red Car Wine Company, the Pali Wine Company's Russian River Valley Proprietary Reserve; Donum Estate's Carneros Pinot Noir; and A. P. Vin's Kanzler Vineyard Pinot Noir. 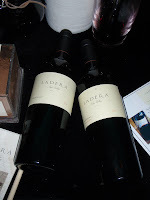 We also drank amazing Cabernet Sauvignon from Ladera Vineyards, Flora Springs Winery & Vineyards, and Andrew Geoffrey Vineyards; Cabernet Sauvignon and Syrah from TOR Kenward Family Wines; and Sauvignon Blanc from Silver Pines Vineyards. The event was definitely California top heavy - but there were wines from Bordeaux - including our friends at Château Lascombes; Spain; Austria; and most importantly Italy. We found two gems from Sicily, both from Planeta. The La Segreta Bianco is a a blend of 5 white varities - predominately the native Grecanico, then smaller amounts of Chardonnay, Viognier, and Fiano. The second was the Santa Cecilia, made from 100% Nero d'Avola. This wine provides a mouthful of flavor, with a smooth, balanced tail. These are two nice wines and coming from Sicily, they must have great price points. Then there was the food. Even though we are food novices, many of the chefs were familiar to us: Masaharu Morimoto, Tyler Florence, Michael Psilakis. A couple to add to this list are now Michael Symon and Andrea Curto-Randazzo & Frank Randazzo. Everwhere you turned there were plates of gourmet food - we stuffed ourselves worse than any Thanksgiving dinner. You couldn't help it. 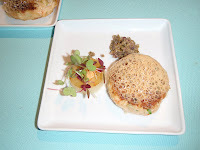 The crabcakes from a now forgotten chef was the absolute best. (By this point our journalistic skills were quite diminished.) 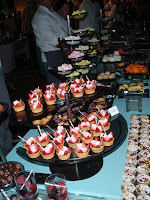 The dessert bar was something out of a dream: truffles, mini key lime pies, apple caramel - you get the idea. The Best of the Best was probably the most worthwhile ticket for the weekend, even with the $300 tag. Its one we will not forget. 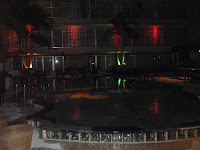 Feeling ambitious we ended the night at the Hotel Victor and the Seven Daughters SoBe Soundcheck. The party was held surrounding the rooftop deck and included burgers, Seven Daughters wine, Swiss Vodka, more desserts from the hotel's restaurant, Vix Restaurant, music from The Cringe, and for those interested, Rachael Ray. The Cringe is fronted fronted by her husband John Cusimano. But after one vodka tonic, we had miscalculated. We were done. After gorging and drinking at the Best of the Best - we needed bed. Not even the pool, music or Food Network celebrities were an incentive to remain. We'll have to catch The Cringe another time in New York or SXSW. Ingrid Hoffman, we see you Saturday.